Horizon Fitness Elite E9 Elliptical Review by Industry Experts! 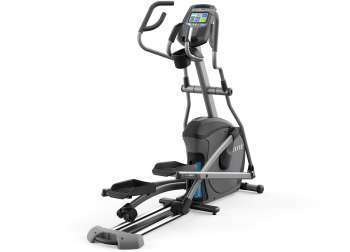 The Horizon Elite E9 Elliptical Trainer is On Sale! The Horizon Elite E9 elliptical trainer is their top model and it is loaded with features that offer a very rewarding cross-training experience. In addition to the Six Star ergonomic specs, the Elite E9 is also equipped with ViaFit and Virtual Active, which are designed to track your progress, help you reach your fitness goal, and take the monotony out of exercising in place. The complete package makes the Horizon Fitness Elite E9 elliptical trainer one of the top cross trainers at the $1,899 price range. Horizon is produced by the same company that makes Vision Fitness and Matrix Fitness products. Smooth Momentum – The Elite E9 uses a large drive pulley ratio that results in a smooth and efficient elliptical motion. Narrow Pedal Placement – The benefit of a front drive elliptical trainer is that typically the pedals are closer together. Horizon places the pedals as close as possible on the Horizon Elite E9, which reduces stress to your hips. Wide pedal separation can be particularly stressful to women. Straight Body Posture – Many front drive elliptical trainers tend to force you to lean forward because of the positioning of your body over the mechanism. On the Horizon Elite E9 your body is in an upright posture that is more comfortable. Natural Elliptical Stride – Rather than an oval, bouncy stride, you get a flatter elliptical pattern that mimics running or walking. Which is also less stressful to your joints and lower back. Low Pedal Height – The pedals are easy to mount and dismount because of their low 10” height, that is in comparison to a rear drive elliptical that can be awkward to get on and off. Power Incline – Adjusting the incline allows you to change up your routine. It also gives you a more intense cardio working and the ability to target different lower body muscles. 30 Lbs. Flywheel – This heavy flywheel guarantees a very smooth and natural elliptical motion. You’ll how when you start it takes an effort to move the flywheel, and when you stop it takes a second or to for the motion to stop. 20” Stride Length – This is a standard stride length that can accommodate the majority of elliptical users. If you are particularly short or tall you may want to consider a machine better suited to your height. Console Features – You get speakers, MP3 input, reading rack and a bottle holder. The sound is adequate, which is what you should expect on a fitness equipment. 216 lbs. Machine Weight – Users will find the Horizon Elite E9 to be very stable, unless they happen to be a sumo wrestler. Cushioned Pedals – The pedals have an arched cushion that that allows you foot to pivot naturally and is designed to reduce foot numbness. Multi-Grip Handlebars – The Horizon Elite E9 comes with handlebars that have multiple grips so you can target different upper arm muscles. You can also remove them if you prefer to exercise with the stationary grips and not the moving handlebars. Warranty – The coverage is standard at this price range. It should be noted that Horizon has some of the better customer service in the industry. 7” Touch Screen Full Color Display – The vibrant colors are an improvement over the typical LCD displays. It provides feedback on speed, time, distance, calories, RPM, resistance level, heart rate and watts. It also will show videos from Virtual Active (See below). ViaFit – The Horizon Elite E9 elliptical is equipped with Wi-Fi, and is able to download your stats to your online ViaFit account, allowing you to track your progress towards your fitness goals. In addition, with the ViaFit account you can define fitness goals like number of workouts, calories burned, amount of time exercising or total distance and track your progress. ViaFit also allows you to import fitness and nutritional stats from other popular apps, giving you a central resource to track data from numerous apps. Studies have shown that those individuals that track their progress are more likely to achieve their fitness goals. And in fact, tracking software, particularly on smartphones, is becoming very popular because it motivates people. It is the ability to converge all your fitness, health and nutritional data into one resource that makes ViaFit appealing. Horizon is the only company that offers this unique feature. Virtual Active – Obviously running in place can be boring. That is why so many people watch TV as they run. Horizon offers another alternative, the ability to virtually run some of the most famous landscapes in the world. The way Virtual Active works is that individuals with head cameras ran numerous famous locations. You can call up one of these videos and simulate running the terrain. Your speed will trigger the speed of the videos. You can view these videos on the full color display. There are several other companies offering a similar technology and they are proving to be popular with users. The Horizon Elite E9 comes with two Virtual Active videos. Additional videos are available for an extra cost. New videos are being continually released. Passport – Passport lets you show the Virtual Active videos on your big screen through the Passport box. There is an additional cost for the Passport box and cables. At around $1,900 you should expect a cross trainer that provides a superior experience, and the Horizon Elite E9 elliptical trainer delivers just that. It combines ergonomic engineering with attractive interactive features designed to help you achieve your fitness goals. In addition, you are getting an elliptical that will be low maintenance. You only need to occasionally lubricate the rails. With the Elite E9, Horizon has proven that it is a top contender in the residential cross-trainer industry. If you like this model, you may want to also check out the Horizon Elite E7 for a slight variation on features and price. To learn more, check out HorizonFitness.com.